ARALIACEAE. One to three species. 'JAPANESE ARALIA'. Bold tropical-effect foliage. Large palmate glossy dark green leaves to 16" wide. Large heads of round clusters of creamy white flowers in late summer, followed by attractive black berries. Shrub to 8 - 20 feet. Japan, Korea. Zone 8. Good houseplant in the North. Stands pollution, salt spray. Germinates in 2 - 3 weeks or so. MYRTACEAE. 'PINEAPPLE GUAVA' Small trees of dry subtropical S. America, with showy flowers and edible fruits. Easily grown, pest-free and drought-resistant, they stand a few degrees of frost (down to 10 - 12°F) and are favorites in California. Sow seed in a mixture of sand and sawdust compost to prevent damping off. Germinates in in 2 - 5 weeks. Plant out when at least 4" tall. Seed viable a year or more. 'PINEAPPLE GUAVA'. Dull green 1 - 4" long fruits have delicious pineapple- flavored pulp. Eaten fresh or cooked, crystallized, or made into jam or jelly. A handsome little tree to 18 feet, with a broad crown and showy 1 1/2" flowers with thick petals, purple inside, and having long crimson stamens. Olive-like foliage. Brazil, Argentina. Zone 8. The thick, fleshy petals are also edible, having a rich, aromatic flavor. The fruits are much valued by various S. American tribes. They are best picked from the ground after they fall, as these have the most delicate and fully developed flavor. Germinates in 2 - 5 weeks. FOUQUIERIACEAE. 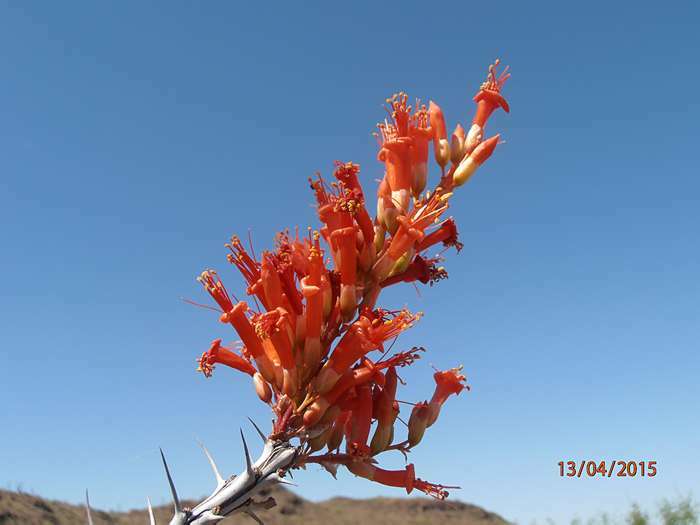 Peculiar showy desert shrubs and trees grown for their bright flowers and spiny, often leafless branches. The genus (and family) are restricted to SW North America. Of diversity sampling interest. 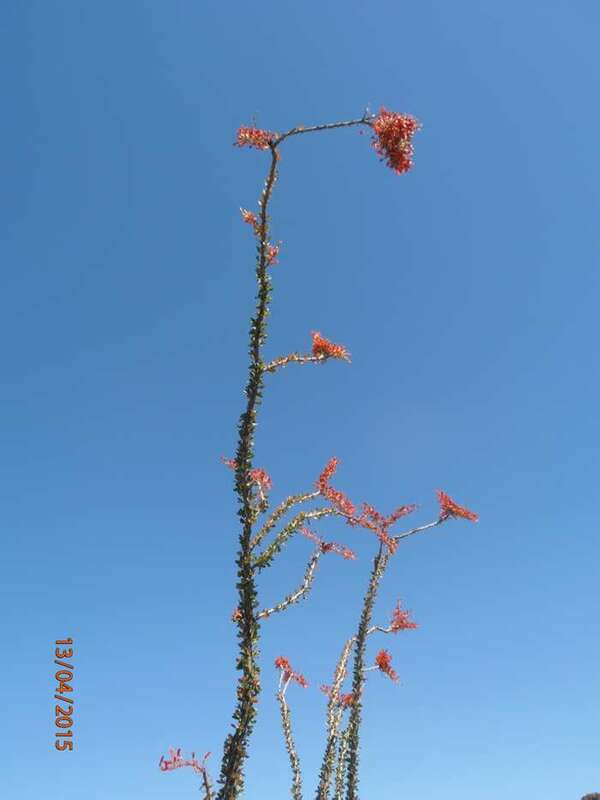 'OCOTILLO'. Brilliant red, inch-long, trumpet-shaped flowers in clusters up to 10" long. Base branching shrub to 20 feet, with long, straight thorny branches, leafless in dry periods. SW U.S. The flowers, young pods and seeds have been eaten. Germinates readily in 1 - 2 weeks warm. ROSACEAE. 'STRAWBERRY'. Well-known perennials grown for their delicious fruit, attractive trifoliate leaves and charming five-petaled flowers. Easily grown in any ordinary, moist, well drained garden soil. Mulch beds with straw in winter. Many species make excellent ground covers. 'ALPINE STRAWBERRY', 'FRAISES DES BOIS', 'PERPETUAL or WOODLAND STRAWBERRY'. Bushy, compact, upright runnerless plants bear small but very flavorful and fragrant strawberries. As we who gather wild strawberries know, the modern types have sacrificed flavor for size. These small-fruited alpine types have excellent flavor, and if started early can bear some fruit the first season. Excellent for edgings and pots, and may be mowed as ground cover. Part shade or full sun. Nearly everbearing, giving all summer. Zone 4. Sow early, barely cover, to sprout in 1 - 4 weeks at cool to warm temperatures. Plant out 6 - 12" apart. Sweet and very aromatic red fruits on bushy, runnerless plants. An excellent selection. Germinates in 1 - 4 weeks. 'GOLDEN-LEAVED ALPINE STRAWBERRY'. Foliage starts out golden in spring, changing to light green. White flowers and sweet, aromatic red fruits. Hardy perennial to 8". Zone 4. Nice! Small yellow sweet strawberries, fragrant and flavorful. May and June. Zone 5. Germinates in 2 - 6 weeks. 'ALPINE STRAWBERRY'. Large red aromatic fruits. Very productive and long bearing. 'WILD WOODLAND STRAWBERRY'. Tiny red strawberries and white flowers. Forms neat 8 - 10" mounds, but has few runners. Europe. Fragrant, flavorful strawberries. Zone 4. Germinates in 2 - 8 weeks. SAXIFRAGACEAE. A single variable species from Chile, often subdivided. Germinates readily. LILIACEAE. Hardy North Hemisphere bulbs with odd, often checkered, nodding bell-shaped flowers. Most do well in any rich garden soil and part shade. 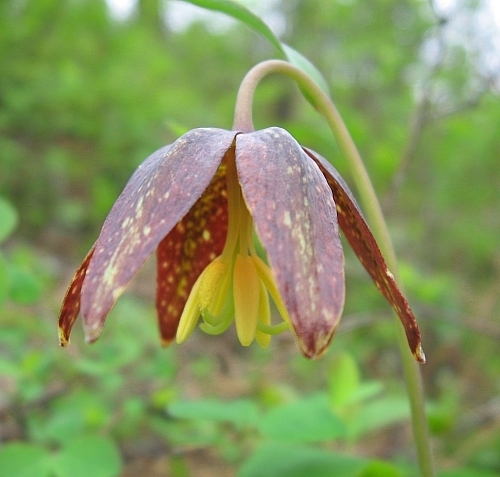 'CHOCOLATE LILY', 'RICE-ROOT FRITILLARY', 'MISSION BELLS'. 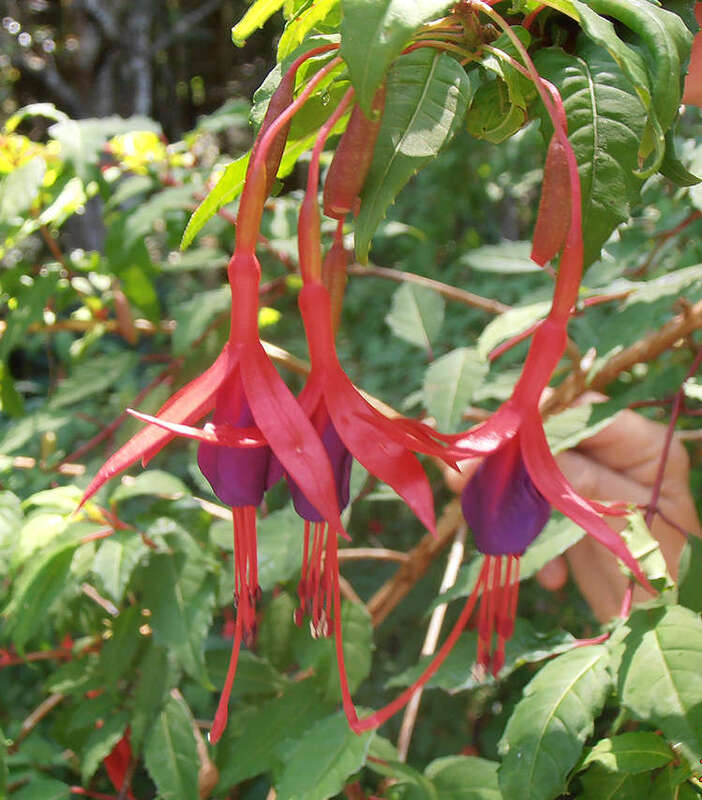 Nodding, mottled and checkered, purple-bronze and yellow, 1 - 2" bells, up to 19 on a stalk. To 1 1/2 - 3 feet tall. California to B.C. Germinates in 4 - 12 weeks at cold temps. Bulbs produce many rice-grain bulblets. Produces a single, shining, strap-like radical leaf the first few years until ready to flower. The bulbs were eaten by Indian tribes, perhaps after special preparation. 'YELLOW CROWN IMPERIAL'. Showy yellow bell-shaped 2" flowers held in circlets at the top of the stem, in early spring. Hardy bulb to 4 feet. Central Asia. Zone 4. Germinates in 3 - 7 months at cold temperatures. 'YELLOW FRITILLARY'. Yellow or orange 3/4" flowers tinged purple. To 12". W. N. America. Zone 3. Germinates in 3 - 4 months at cold temperatures. ONAGRACEAE. Ornamental shrubs for mild climates. COMPOSITAE. Showy summer-flowering annuals and perennials from the Americas. Easily grown in well-drained soil and full sun. Long period of bloom, and they last well in water and are favorite cut-flowers. 'BLANKET FLOWER'. Large showy daisies up to 5" across, in rich shades of red, orange and yellow, often bordered with darker maroon zones. Blooms from June to frost, and makes excellent long lasting cut flowers. Hardy perennial to 1 - 3 feet, with deeply cut leaves. Great Plains. Zone 3. One of our finest natives, it is easily grown as an annual or perennial. Good in heat, full sun and dry areas. Germinates in 1 - 3 weeks at cool to warm temperatures. Large golden, fringed flowers with amber-red centers. Hardy perennial to 30". Zone 3. Cut-flower. Nice coppery-scarlet with yellow edge. To 30". Glowing rich wine red. Showy. To 30" tall. Deep crimson 3" flowers with a yellow edge. The first dwarf, only 12 - 14" tall. LILIACEAE. Hyacinth-like South African bulbous plants grown in rich moist soil for summer bloom. 'GIANT SUMMER-HYACINTH'. Nodding pure white fragrant 1 1/2" flowers in 3 foot tall spikes of 20 - 40 blooms. Large strap-shaped leaves. South Africa. Long-lasting bloom. Zone 7. Germinates in 3 - 5 weeks. RUBIACEAE. Shrubs and trees grown in warm regions for their fragrant flowers. Sun or part shade. 'STARRY GARDENIA'. Large, fragrant, creamy-white 3" wide funnel-shaped flowers with pointed petals. Shrub to 10 feet tall and 20 feet wide, with 6" glossy dark green leaves. South Africa. Zone 9. Will scent a whole greenhouse when in bloom. Germinates in 4 - 8 weeks. Orange flowers marked with red, on a shrub to 6 feet. W. Australia endemic. Zone 9. Nick seed 10 germinate in 2 - 3 weeks. Flowers range from orange and yellow to white with red centers. Bushy shrub to 5 feet. W. Australian endemic. Zone 9. Nick seed to germinate in 2 - 4 weeks. ERICACEAE. 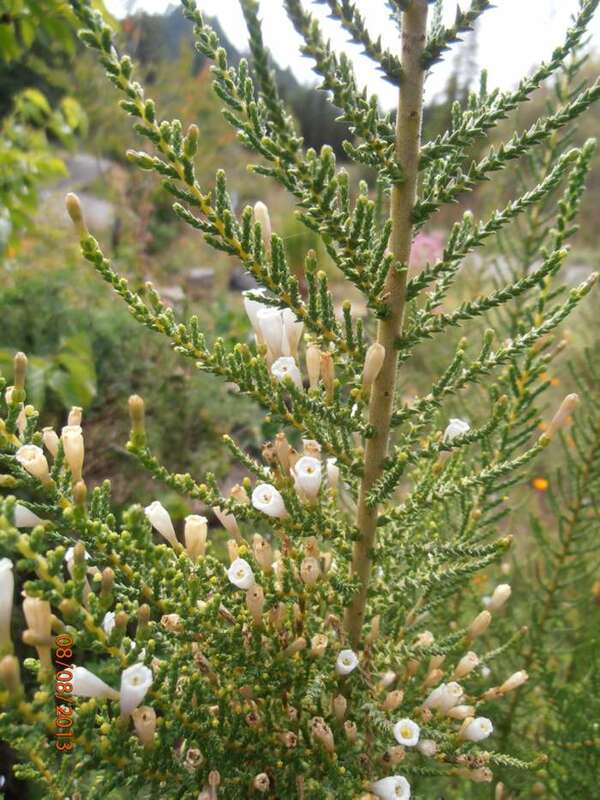 Evergreen woody or herb-like plants with urn-shaped flowers and often edible fruits. Prefers sandy, peaty soil with plenty of moisture, and part shade. The dwarfs are good in the rock garden. Good wildlife food. Some are medicinal. Sow on the surface - light is essential. Some need cold. Germinates in 30 - 100 days. Seed viable 3 years. 'SALAL'. Racemes of pinkish-white, urn-shaped flowers in spring. Spreading shrub to 1 - 6 feet, with 2 - 4" shining evergreen leaves. Dark purple-black 1/4" berries. Coastal California to B.C. The attractive foliage is prized for decoration, and the spicy, aromatic berries are eaten by Indians, fresh, cooked with grease, or dried for winter use. Valuable wildlife forage and watershed protection in forest understorey. The leaves are smoked with kinnikinnik and used medicinally. One of our finer natives. Surface sow, light helps, germinates in 2 - 4 weeks. ONAGRACEAE. Showy-flowered North American annuals and perennials. Good in the border or the wild garden, in well-drained to sandy soil. Full sun or part shade. Grow as annuals in the North. 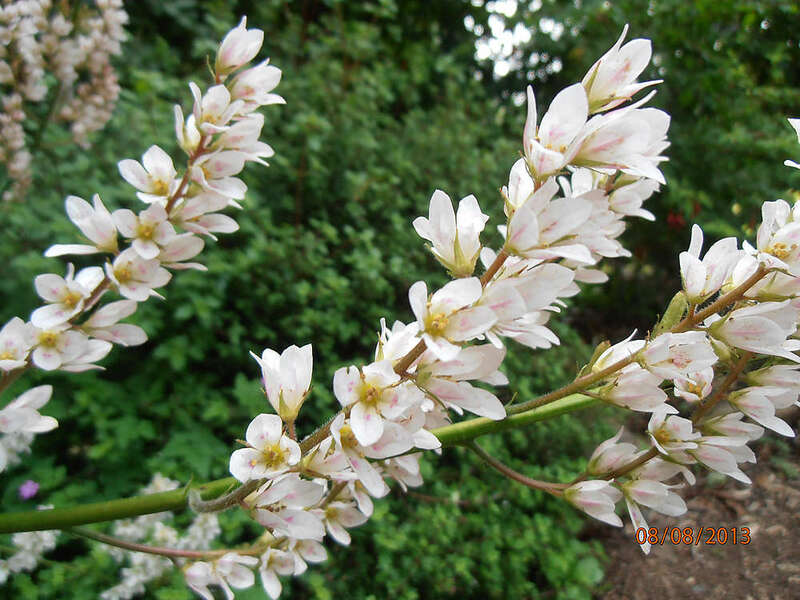 Tall, wand-like spikes of 3/4" white flowers with rosy filaments, blooming over a long period, July to October. Bushy perennial to 3 - 5 feet. Texas. This selection blooms the first year from seed, and has improved winter hardiness. Zone 5. Germinates in 2 - 6 weeks. "We know that ants and certain Lamellicorn beetles are capable of feeling an attachment for each other, and that ants recognise their fellows after an interval of several months. "—Charles Darwin. GENTIANACEAE. 'GENTIAN'. Some 300 species of mostly perennial herbs grown in the rock garden for their beautiful flowers. As northern or alpine plants, most need cool temperatures and well-drained soil with constant moisture. Hot dry climates don't suit them, and in marginal areas plant on the north side of a stone to insure a cool root. Long-lived once established. Give loose, sandy, peaty soil, and the Asian species will not stand lime. Shade seed pans. Sow in fall or early winter, or give 2 months cold. Many are highly irregular in germination, giving seedlings in as little as two weeks, with stragglers sprouting over the next 4 years, so hold your flats! Seed half-life 3 years. Some have internal clocks. Many gentians do best with GA-3 and cool or cold temperatures, but will give some germination at cool temperatures - usually giving plenty of plants per packet this way. Try GA-3, or 2 weeks at 40°F, then 2 weeks at 50°F. 'WILLOW GENTIAN'. Deep blue 1 1/2" tubular bell-shaped flowers in clusters, July to September. Hardy perennial to 2 feet, with arching leafy stems. Europe. Zone 3. Germinates in 2 - 8 weeks warm. GERANIACEAE. Wide-ranging herbs with attractive often palmately divided leaves and charming, often showy 5-petaled flowers. Easy in most soils, good in the border, rockery and under trees. These are not greenhouse 'geraniums', which are Pelargonium. Deep lilac-blue inch-wide flowers in June to August. Compact hardy perennial to 10", with stunning deep reddish-purple divided foliage. Eurasia. Zone 4. Comes 98% true from seed. Scratch seed lightly to germinate in 1 - 4 weeks. Large flowers in white, soft pink, light and dark blue, violet, and white with blue splashes, June to August. Hardy perennial to 20". Eurasia. Zone 4. Scratch seed lightly to germinate in 1 - 4 weeks. 'SPLISH-SPLASH'. Large white flowers attractively streaked and splashed with blue, 1 - 2" wide. Hardy perennial to 20", with shiny green 3 - 8" wide, deeply divided leaves. Eurasia. Zone 4. Scratch seed lightly to germinate in 1 - 4 weeks. 'HERB ROBERT', 'RED ROBIN'. Dark pink to red 3/4" flowers from May to October. Annual or biennial to 4 - 20", with finely divided ferny aromatic foliage. N. Hemisphere. Good to carpet part shade. Zone 6. Medicinal. Scratch seed lightly to germinate in 1 - 4 weeks. Deep bronze-purple inch-wide leaves. Perennial to 4", with small white or pink flowers in summer. New Zealand. Zone 5. Nick seed lightly. White, pink, lavender, and violet flowers, and variously lobed leaves. A nice mix of hardy perennial kinds to 8 - 18". Zone 5. Includes Johnson's Blue, Vision Pink, Ingwersen's Variety, G. sanguineum, G. sanguineum Album, G. sanguineum striatum, and other kinds. Lightly nick seed. ROSACEAE. Easily grown hardy perennials with bright red to yellow flowers. Good for cutting. Best in sun and well-drained soil. 'FIREBALL'. Large, double, rich glowing scarlet flowers, good for cutting. Hardy perennial (to zone 6) forming a 15" mound of foliage with the flowers held well above it at 2 feet. Chile. Zone 4. Blooms May to July. An old favorite variety. Germinates in 2 - 3 weeks. POLEMONIACEAE. Colorful western N. American annuals, biennials, and perennials, thriving in dry, sunny, well-drained spots. Easily grown. 'BIRD'S EYES'. Clustered violet to lavender bell-shaped 3/4" chocolate-scented flowers with yellow throats spotted purple and with blue pollen, from June to September. Hardy annual to 1 - 2 1/2 feet, with feathery foliage. California. Space 6 - 12". Germinates in 1 - 2 weeks. IRIDACEAE. Well-known African and European tender and half-hardy cormous plants grown for their showy spikes of funnel-shaped flowers. Some are hardy in the North if mulched. Blooms best if crowded. Most germinate at cold temperatures. Rosy red 2" flowers in 2 - 3 branches of 8 - 20 blooms, June and July. 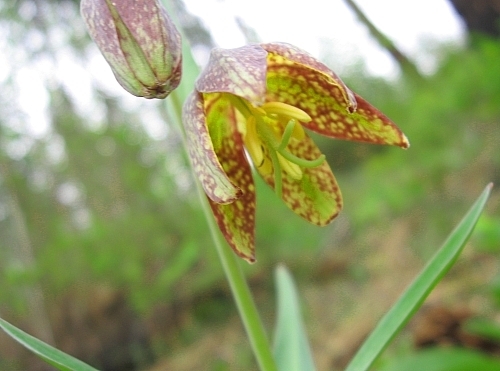 Hardy bulb to 3 feet, with sword-shaped leaves. Meadows of Europe. Zone 5. Germinates in 8 - 12 weeks at cool to cold temperatures, and KNO3 helps. Purple- red 1 - 2" flowers in spikes of 3 - 10 blooms in April to August. Hardy perennial to 16 - 20", with foot-long sword-shaped leaves. Europe. Zone 6. Good in meadows. Germinates at cold temperatures. GA-3 helps. Will germinate in 1 - 5 months. 'FIELD GLADIOLUS'. Purple-pink 1 1/2" flowers in spikes of up to 15 blooms, spring or summer. Perennial to 10 - 30", with grass-like leaves. South Europe. Zone 6. Germinates in 4 - 12 weeks at cold temperatures. PAPAVERACEAE. Distinctive annuals biennials and perennials, best in poor dry soils in full sun, where they bloom better and are longer lived. The perennials may be grown as annuals if started early, but they don't transplant well. Germinates in 1 - 3 weeks at cool to warm temperatures. Sow in spring or fall. "Striking plants for the border or wild garden."—C.O. Booth. 'ORANGE HORNED POPPY'. Large showy orange-red 2 - 3" flowers followed by foot-long ornamental pods. Hardy biennial or perennial to 20", with striking rosettes of glaucous succulent lobed blue-green foliage. Europe. Zone 5. Good in poor sandy soil. Use GA-3 to germinate in 2 - 4 weeks. LEGUMINOSAE. 'HONEY LOCUST'. Handsome ornamental trees grown throughout the world. Vigorous, hardy, fast growing, drought resistant, standing almost any soil except heavy clay. They are excellent for shade, impenetrable hedges, timber and fuelwood production, erosion control, human, livestock and wildlife food, shelterbelts, etc. Tolerates alkalinity and salinity. Easy from seed, but has a hard seed coat. Either nick and soak, or cover with 3 - 4 times their volume with almost boiling water and soak till swollen. Sow shallowly to germinate in 1 - 4 weeks warm. 'THORNLESS HONEYLOCUST'. Thornlessness is a genetically dominant trait and comes true from seed. Other than lack of thorns, this tree has all of the fine properties of the thorny kind. "Over half of my thornless honey locusts wintered over! Many days we dropped below –40°F. "—D.J., Saskatchewan. 1/97. LEGUMINOSAE. 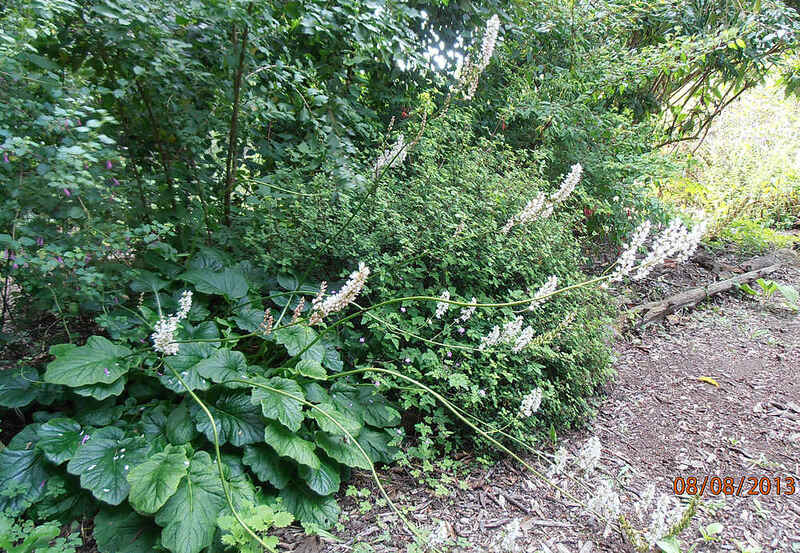 Wide ranging perennials with pinnate leaves and spikes of flowers in summer. Good in the flower garden or grown for the sweet roots. 'LICORICE'. 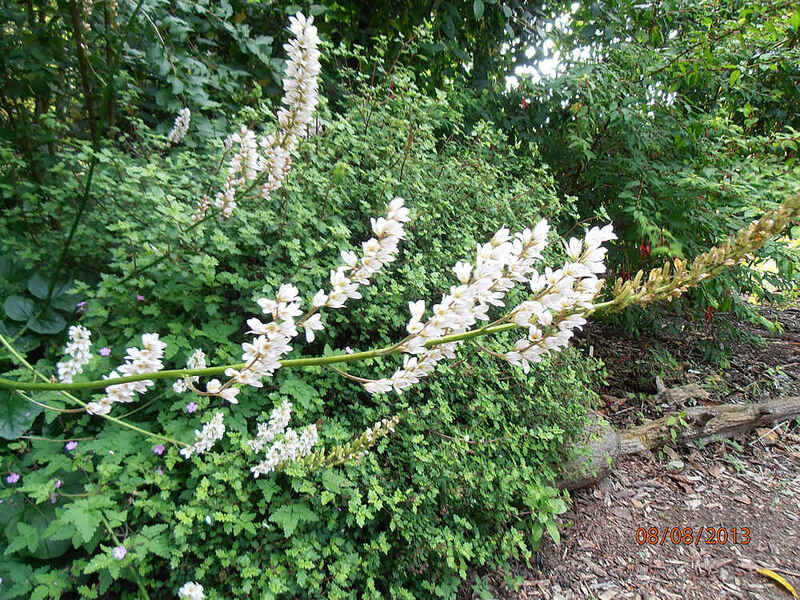 Pale blue 1/2" flowers in dense spikes in July to September. Graceful perennial to 3 - 4 feet, with feathery pinnate leaves. Mediterranean to SW Asia. Much grown for the production of licorice roots, which contain glycyrrhizin, 50 times sweeter than sucrose. Leaves were used as tea by the Mongols. For best quality roots, a deep fertile soil with water during the growing season but hot, dry weather in late summer. Harvest roots the second or third season. Germinates in 1 - 6 weeks. 'GAN CAO', 'CHINESE LICORICE'. Hardy perennial to 3 feet, with white-violet flowers in spikes and feathery foliage. China. The source of Chinese licorice, used as a Qi tonic and adaptogen. Germinates in 2 - 4 weeks. 'YUNNAN LICORICE', 'YUN NAN GAN CAO'. Small purple flowers in dense heads in May and June, followed by pods with pinkish hairs. Perennial to 3 feet, with feathery 4" leaves. Mts. of Yunnan, China, to 8000 feet. Zone 8 or 9. Nick seed to germinate in 1 - 2 weeks. LEGUMINOSAE. Spectacular Australian shrubs with bright lemon-yellow flowers. "These are among the most beautiful and spectacular flowering plants..."—Robinson. Good in California. Smoke treatment may help germination. 'PAINTED LADY'. Abundant pink-purple flowers on a heath-like shrub to 6 feet, with needle-like leaves. W. Australia. Zone 9. Nick seed to germinate in 1 - 4 weeks. AMARANTHACEAE. 'GLOBE AMARANTH'. Popular annuals and perennials grown for their brilliantly colored clover-like flowerheads, which are among the best everlastings. Good for borders and edging. Prefers rich, well-drained soil in full sun, and they tolerate drought and hot weather. Good pot plants for a sunny window. Best started indoors in February and March, or outdoors after danger of frost. Germinates in 1 - 3 weeks at warm temperatures. Space 12" apart or grow in 5" pots. Cut flowers when almost fully open for drying in an airy place. True scarlet-red 2" flower-heads in great profusion. Good for cutting, they keep their color dried. Annual to 1 - 2 feet. Germinates in 1 - 3 weeks. PROTEACEAE. 'SPIDER FLOWER'. Australian trees and shrubs grown in warm regions for their peculiar, often brightly colored flowers, Good in tubs in the greenhouse. Drought resistant once established. Full sun and well drained soil. Soak seed for 48 hours, to germinate in 2 - 10 weeks. Light and smoke treatment may help germination. Seed gives good germination for up to 4 years. 'JOHNSON'S GREVILLEA'. Brilliant red or orange spidery flower clusters in spring. Rounded shrub to 15 feet, with narrow 4 - 10" divided leaves. E. Australia. Zone 9. Nick to germinate in 3 - 16 weeks. 'HOLLY-LEAF GREVILLEA'. Creamy white flowers in pendant clusters. Rounded shrub to 3 - 5 feet, with blue-green holly-like leaves. W. Australian endemic. Nick to germinate in 2 months or more. A 5% smoke solution helps. Golden-orange 6" clusters of flowers in winter and spring. Variable, ranging from a shrub to a tall tree, with 16" pinnate leaves. North Australia. Germinates in 2 - 8 weeks, light nicking may help. COMPOSITAE. Free-blooming herbs of western North America and South America. Good for hot, dry sunny places, and are favorite western wildflowers. Easy. GUNNERACEAE. Perennial herbs ranging from gigantic plants grown for their bold foliage, down to tiny mat-forming dwarfs. Best in cool, moist, mild climates—excellent on the Pacific coast. I've had the best results by rubbing the seed out of its husk, then soaking in rubbing alcohol for 15 minutes to remove germination inhibitors. Then it will give good germination over 1 - 10 months. 'GIANT GUNNERA'. Gigantic leaves can reach 5 - 10 feet across, rising in a cluster from the crown. Flower cluster 1 foot thick and 3 - 4 feet tall. S. Brazil. Zone 7. Occasionally forms a magnificent clump 25 - 35 feet across. Best grown near a pond to insure a steady supply of moisture. LEGUMINOSAE. Two species of deciduous trees grown for ornament and timber. Stands heat, cold, drought and poor soil. Seed has a very hard coat and needs deep nicking to germinate in 2 - 6 weeks. 'KENTUCKY COFFEE TREE'. Large tree to 50 - 110 feet, with large 1 1/2 - 3 foot long bipinnate leaves, which are pinkish in spring, deep green in summer, and clear yellow in fall. Greenish 1/2" flowers in foot-long racemes on female trees, 4" clusters on males. Females produce persistent thick red-brown 6 - 10" pods filled with large seed and pulp. E. U.S. Zone 4. The seeds are said to have been roasted as a coffee substitute in the 1700's, and were roasted and eaten like nuts by the Indians. The bruised leaves or pod pulp sprinkled with sweetened water are said to attract and kill flies. "One of the most handsome of all hardy trees."—Hilliers. The seeds were used as counters in an Indian game. They make excellent beads, taking on a high polish. CUCURBITACEAE. Two east Asian trailers. 'SWEET TEA VINE', JAIO-GU-LAN'. Yellow-green flowers followed by smooth black 1/2" berries. Annual or perennial trailer to 25 feet, with attractive shiny divided leaves. East Asia. Zone 8. Considered an 'immortality plant' in Chinese medicine, the leaf tea contains compounds similar to ginseng, and is adaptogenic, anti-diabetic, neuro-protective, etc. Germinates in 3- 6 weeks warm.